Hawaiian Wedding Couple | MWAH! S&P Shakers Figurines | One Price Low Flat Shipping! From Westland Giftware's Mwah! Retired Salt and Pepper Shakers Collection, Hawaiian Wedding Kissing Couple. magnetic shakers. Made of ceramic with glossy finish. Measures 4" tall. Hand wash only. This salt and pepper shaker set features a bride and groom both dressed all in white with Hawaiian themed accents, each wearing a festive lei celebrating the taking of their vows with a kiss. 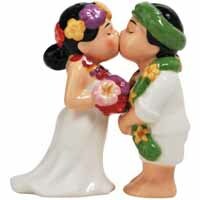 Great cake topper or party favor for a Hawaii wedding theme!